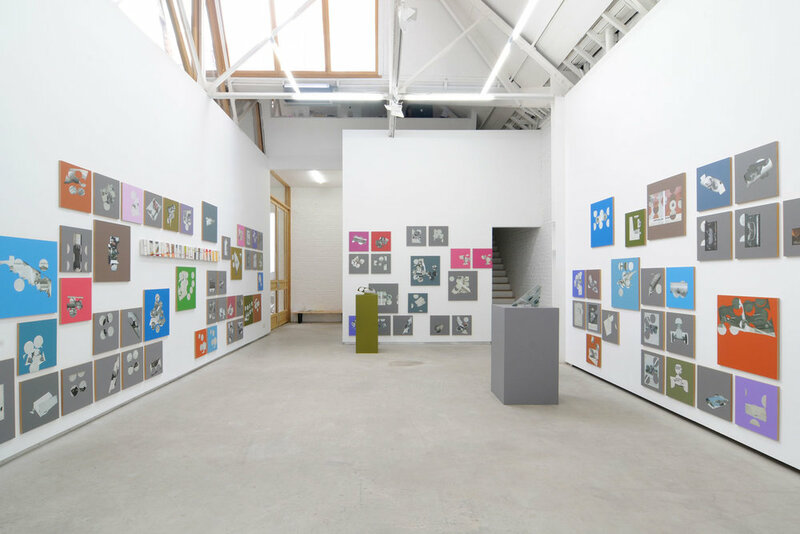 Second solo exhibition at Catherine Bastide by the American artist Kelley Walker. Organized around a series of recent works, this exhibition presents a new direction in his work. While elaborating upon the research of the artist’s experimenting with the very materiality of the media image, this ambitious, radical and complex project is based on an observation of a new relation to things at the time of their massive translation into digital data, as new modes of production and perception of a reality informed by the many technological representations that structure it. The result is a set of nearly two hundred panels: a formalization of astounding accuracy, as a conceptual enigma, an impossible, bewildering image. From a collection of advertisements made in the United States between the 1950s and early the 1970s for cars of the German brand Volkswagen, praising the iconic Beetle car, or Bug, Kelley Walker started work in 2011 on a series of screen-printed works using CMYK inks + pantone on MDF, elaborating these images in a characteristic graphical manner, bestowing upon them a nebulous visual status. To this end, the artist has utilised the computer programme Rhino, which enables him to generate three-dimensional images. Typically programs like this are used in architecture, design, and in the movie industry for the special effects of science fiction films, as well as for video clips, this professional tool creates recognizable, soft and appealing shapes, with fascinating colour gradients. For this series, Kelley Walker has worked together with an architect to realize an experiment which the program in theory is incapable of producing: by forcing the machine to base its reasoning on an existing image in order to create another 3D image, he carries out an “unnatural” experiment that produces a result that is both formally strange and conceptually intriguing. The result is a set of “impossible” forms, generated through the constraint imposed upon the software which is forced to fold, roll or invert the original file (reproduced on the exact scale of the document), as if the computer were obliged to consider the image not just as a mere surface, but as a page, a material thing that has to be manipulated. This mirror reflection of the medium itself similarly echoes the original images, designed by the agency Doyle Dane Bernbach in New York and considered as “revolutionary” in the history of American advertising. 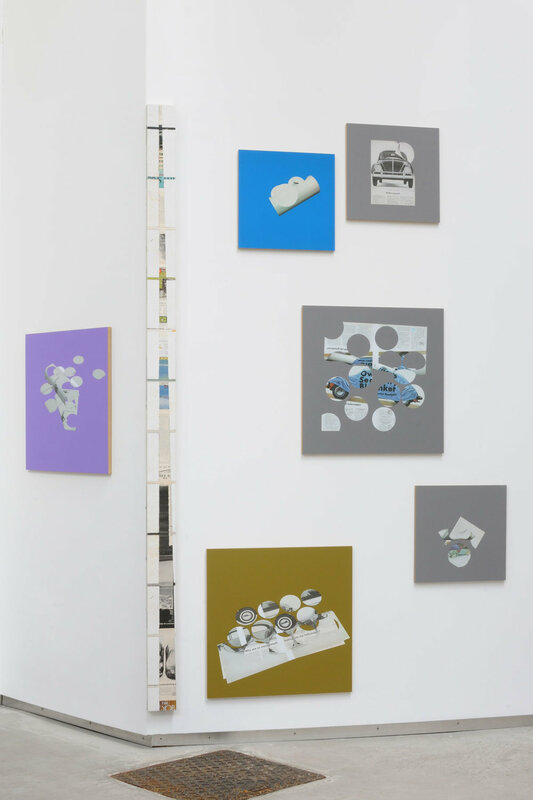 Depicting cars on clear and neutral backgrounds, as objects without scale floating in an abstract dream with a single text caption – simple word associations, often humorous or even poetic (lemon, (yellow), like a garment, a toy or a piece of jewelry) – they mock the very signs of a popular culture in full development and based upon the rule objects, things. The Bug has since then functioned as a prism, an image of standardization, revealing the unconscious of a civilization that has been reproduced ad infinitum, assimilating all areas of society, from culture to sports to politics. Kelley Walker’s project, in short, juxtaposes one technology with another. The culture of the windscreen, the screen of the mobile cinema, the fictionalizing prism through which the American people have seen reality disintegrate since the democratization of the car, matches a 3D film technology that haunts the darkened cinema rooms: the works of the artist point out the specific condition of the perception of a world made distant, as seen through screens, images, and flat mental representations. The advertising photography that has spread the ideology of personal transport informs the new collectivism offered by Internet and the extensive sharing of data: a retro-maniacal universe, populated by phantoms, comebacks, revivals and revenants, pointing to a cultural universe that has become a large market where past, present and future blend together in a historical kaleidoscope in constant motion. The “invisible hand” that guides these collections by creating the illusion that they are able of accessing the entire universe coincides with the limits of a looping software: at a time when the digitization of knowledge suggests “infinite” databases, were are facing, now more than ever, issues regarding the architecture, the intentions, the invisible ideology that inform our research, our explorations in this sea of information. The Volkswagen, the mass produced “people’s car”, reflects the animal dimension of the Bug: the Rhino software (other animal name) creates “veins”, “skins”, surfaces and intricate designs, disturbingly seductive ornaments and envelopes, futuristic and attractive flexible forms, all of which infuse the “pages” used with the spatial , mental dimension of strange constructions. The cold onirism of these digital layers that make up this paradoxical material reflects the use of similar tools by the U.S. military for combat simulations: these works also raise a political question; in a way they lift the veil, the filter that places information, experience and transmission today at the heart of a continuous interference. The conceptual spiral suggested by the work is wide, open and critical. By putting different groups of objects on the same level, Kelley Walker paradoxically defines what philosopher Tristan Garcia has called a sort of flat ontology: the artefacts of history are assimilated in an inventory that is animated by the very tool that today is used to produce the animation ofthe spectacle itself in the literal sense (mainstream cinema), as the spectacle of this animation (the life of things, of all things, animate and inanimate objects, humans, animals, products). In short, this work indeed reveals a modern form of animism; an animism of which the structure, of which the holes made inside complex, fragmentary, and chopped images, hollowed-out cavities and “passages” forge an impossible materiality and reinforce the intended, improbable and impossible constructed dimension of things as distanced fictions that reflect a disavowed reality. Né en 1969 à Colombus, Géorgie, Kelley Walker vit et travaille à New York. 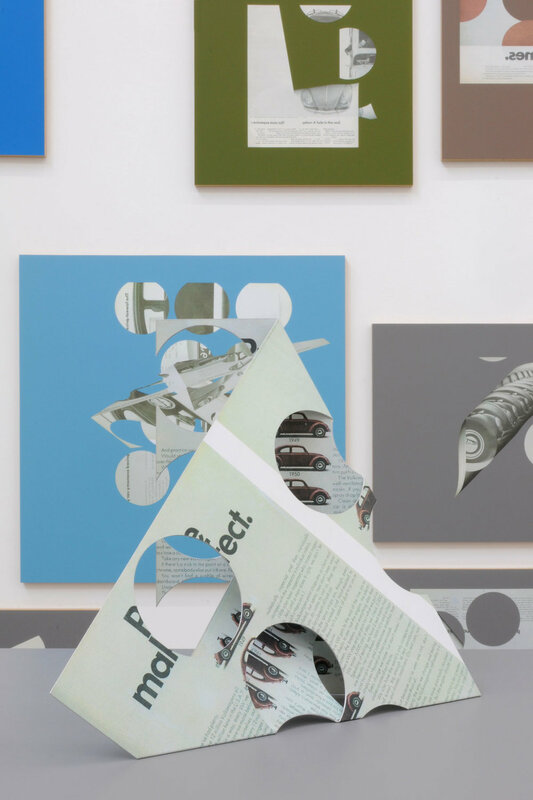 Son travail – des imprimés grand format, réalisés à l'aide de traitements numériques, de sérigraphies et de techniques de collage, incluant également des références à la peinture abstraite – oppose une résistance active et critique aux formes posées par la diffusion de l’art aujourd’hui (et par la communication en général), en s'appropriant différentes images de la culture contemporaine dont le caractère iconique est accentué pour en bouleverser la banalité et en retrouver l’efficacité. 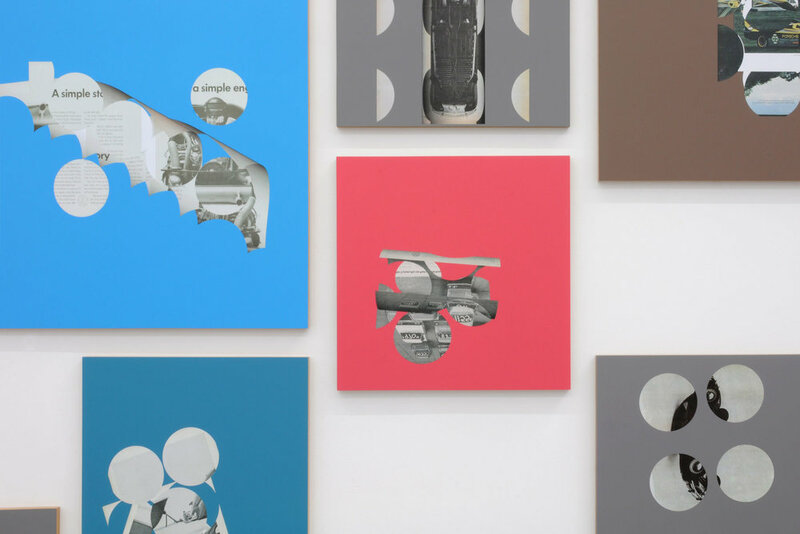 Kelley Walker collabore avec Wade Guyton, Seth Price et Josh Smith au sein du collectif Continuous Project.